Town Council Chairman John Engel speaks as the rest of the Town Council listens. Taken Jan. 9. NEW CANAAN — The Town Council unanimously approved a three-year contract with New Canaan teachers Wednesday. Council Chairman John Engel addressed three concerns regarding the negotiations, including: the “economics of the agreement,” whether it would accommodate later school start times and the process that left a councilman cooling his heels during the negotiations. The Board of Education and the New Canaan Education Association reached agreement on a new three-year contract on Oct. 8, 2018. The Town Council received the document shortly before its Wednesday, Dec 12 meeting. Councilman Michael Mauro made the motion to accept the contract even after he read a statement criticizing the deliberation process. He had voiced his disapproval over the Board of Education leaving him out of negotiations in spite of his credentials as a labor negotiations expert. New Canaan Education Association President Vivian Birdsall said the acceptance of the contract is good for both the teachers and the town. She added that both the teachers and the town work to ensure the students have the best education possible. She also said teachers are supported by a strong community that believes in and support the programs they bring to the community. The new teacher contract for 2019 through 2022 includes salary increases for up to 3% per year, or up to 9.2% over the course of the deal. The document includes a wage increase for teachers at the top step of the grid — about one-third of New Canaan teachers — who in prior agreements would not be getting a raise. The wage increase for those teachers will be 1.5% for each of the first two years of the contract and 1.25% increase for the final year. The school district and the NCEA agreed to insert one additional step to the salary grid, which will increase the amount of time it takes a teacher to reach the top step by one year, “Thereby helping to reduce costs,” according to a press release. The new contract does not change the step increases of 4.5% that roughly two-thirds of the teachers now receive. “We were concerned with the economics of this contract,” said Engel. “Instead, the Town Council has learned that the reported figure of 3% plus each year for three years is the highest potential, and the reality is that we have an expectation that this contract is actually rising around 2% a year,” Engel said. “Town Council got comfortable with the economics of this contract,” he said. The salary schedules in the contract show that teacher compensation is driven by a years-of-service step structure. Teachers step up one salary level and receive pay increases related to experience and years of service. The range spans from the lowest level, which is a teacher with a bachelor’s degree on step three to an educator with a masters degree with 90 certification hours at step 19. The top salary range for teachers will go from $120,823 for 2018-19 to $126,031 for 2021-22. In 2019-20 a teacher with bachelor’s degree will earn from $48,340 to $80,001; with a master’s degree and 30 hours of certification credits will receive from $52,851 to $108,294; and a master’s degree with 90 hours of certification will reap from $61,874 to $122,635. In 2021-22 a teacher with a bachelor’s degree will garner from $48,340 to $81,216; with a masters degree and 30 hours of certification credits will bring in from $52,851 to $111,292; and with a master’s degree with 90 hours of certification will attain from $61,874 to $126,031. Teachers also receive an additional “stipend” each year once they have been working for 15 or more years with the district, ranging from $500 to $900 annually once they have worked more than 35 years. In addition, when a teacher earns a doctorate, he or she receives an “annual salary differential” of $1,000, according to the contract. “In teacher contracts, it is not uncommon to provide a General Wage Increase [GWI] along with step movement, which can place additional financial burdens on the towns,” said Luizzi in a press release. “This agreement, which does not have GWI but does provide step movement, is reflective of the productive and respectful relationship between the Board of Education and the NCEA,” he said. and the entire community,” Luizzi said in a press release. The health care plan includes an increase in teachers’ contributions toward premium costs in the third year of the contract, and an increase to the deductible amount of their High Deductible Health Plan. The school district will pay 80.0% and the employee medical insurance while the teachers will pay 20.0% of the premium for the high deductible health insurance policy for 2019-21. Then the district will pay 79% while teachers pay 21% of the premium in 2021-22. This is up from previous years in which the district paid 81.5% and the employee paid 18.5% of the premium for the HDHP health insurance policy in 2016-17. “The board shall fund 50% of the applicable deductible,” according to the contract. A single teacher will have a deductible of $2,250 with a maximum out-of-pocket expense of $3,250 in network and $5,250 out of network. Employees with families have a deductible of $4,500 with a maximum out-of-pocket of $6,000 in network or $10,000 out of network. Mauro recommended his fellow council members vote to approve the contract. 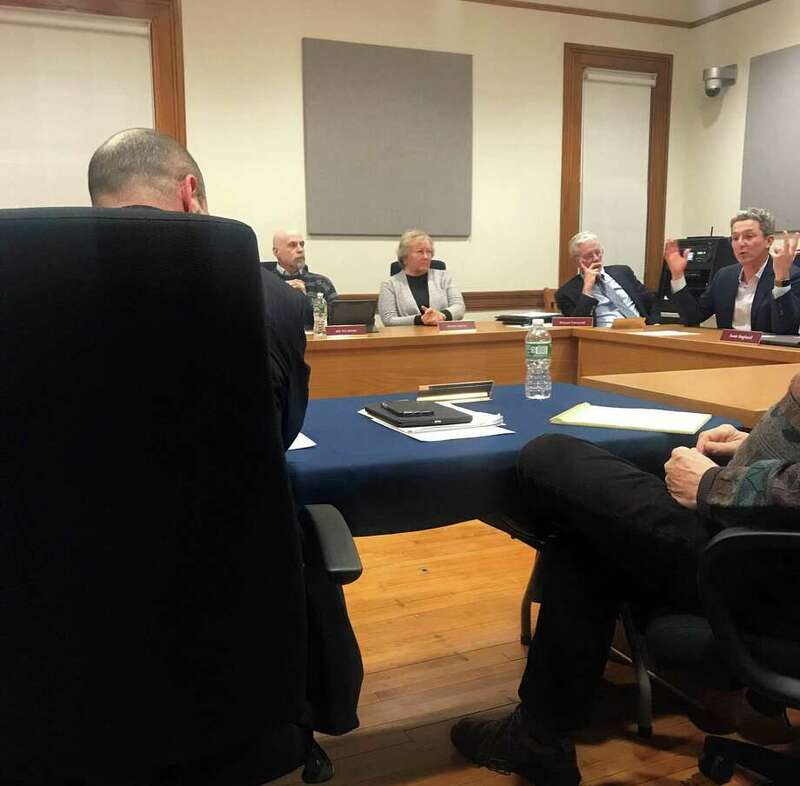 “If Town Council rejects the contract there is a significant risk that it will cost the town more than the deal struck if an arbitrator is asked to decide,” Mauro said. “Can New Canaan afford that risk? Given the fact that property values have declined and the town needs to find $7.6 million dollars in new revenue, I believe the risk may be too great,” he added. “Concerns as Michael has identified with the process have been discussed with Dr. Luizzi and with the chairman [Brendan Hayes] of the Board of Education and they are going to talk about making changes to the process that may involve the Town Council in future negotiations,” said Engel. “I really wish this process had been much different. I was there to be an asset to Board of Education during its negotiation and be a bridge to Town Council,” said Mauro. Engel said that Town Council members had been in numerous meetings, asked several questions prior to the meeting and there was little further discussion.